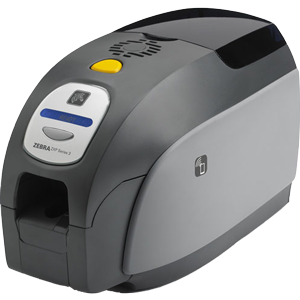 The ZXP Series 3 direct-to-card printer offers several advanced features that provide best-in-class performance at an affordable price point. Zebra's ZRaster™ host-based image processing technology, for example, enables high-speed printing while optimizing image quality. And Zebra is first to market with high-performance ribbons that have an improved formulation specifically designed for high-speed, high quality printing. The ZXP Series 3 slips easily into tight work spaces thanks to its compact footprint, and with easy-to-use attributes like quick-replace Load-N-Go™ ribbon cartridge and LCD display with operating prompts, it requires little training and optimizes uptime. Meet a spectrum of applications with a full suite of buy-now or add-later encoding options, and a choice of connectivity for easy system integration. Compatibility: Windows 7 (32 and 64 bit), Windows XP, Windows Vista, Windows Server 2008, Windows Server 2011. Only for use with firmware v. 2.03 and upwards.